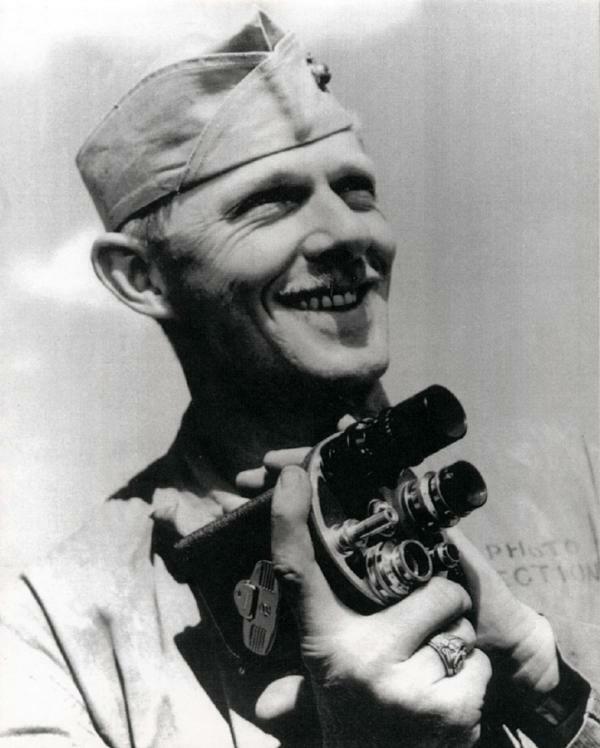 USMC Sgt Bill Genaust posing with his B&H Autoload motion picture camera. My guess – GUESS – is this appears to be a PR shot. If so, it was taken after his actions on Saipan. USMC photo. Now trained in motion picture combat methods, Sgt. Genaust is headed into his first combat. What all Marines train for. He is headed into a hell hole called Saipan. 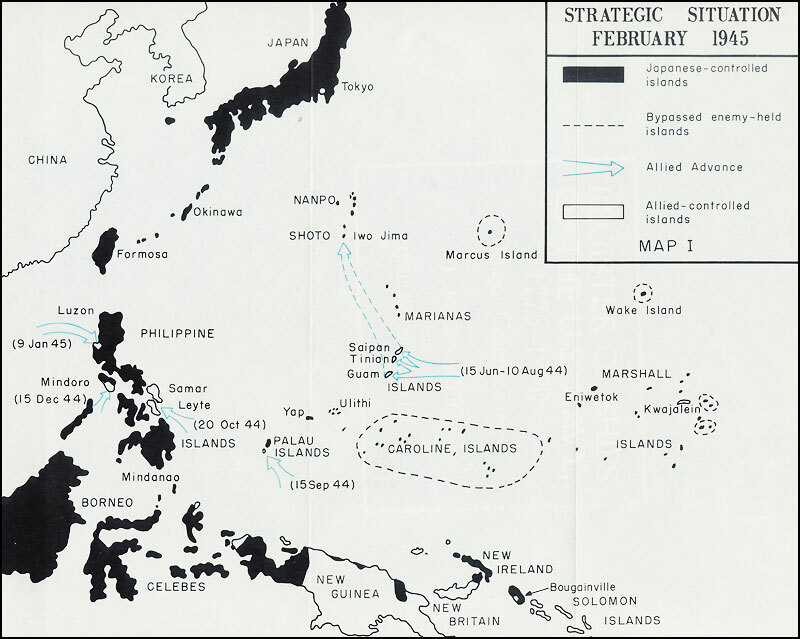 Overview of Pacific Campaign; Saipan is dead center. You can also see Guam and Tinian to the south. Tinian is where the Enola Gay was stationed. USMC report. 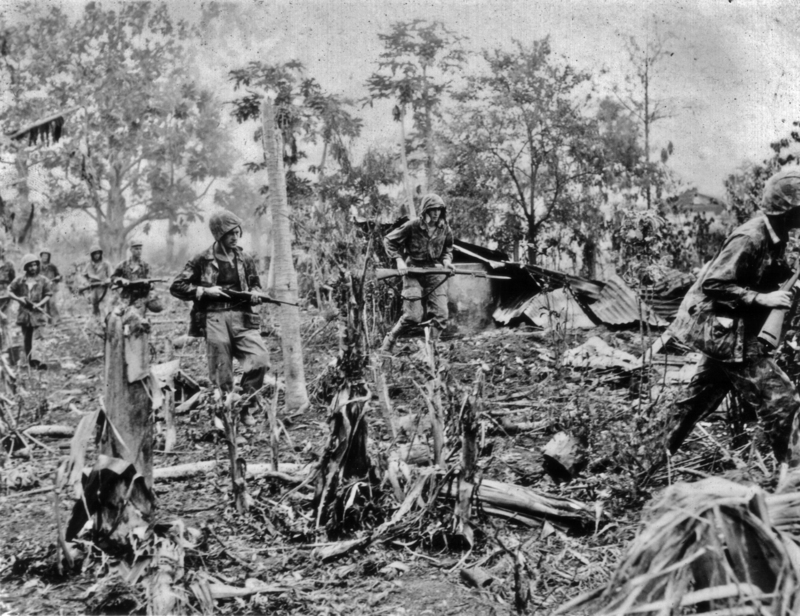 The United States had fought her way up the Solomon Islands campaign with great cost. Saipan was at the edge of the Japanese Empire in 1944. Not only did it have two airfields, the taking of Saipan would allow the US to launch the B-29 bombers against the Japanese homeland. The Japanese command knew this. First and foremost, Saipan was part of their territory having been under their control since 1922. They knew they must keep Saipan out of American hands at all costs or else their homeland would be vulnerable to air attack. US intelligence estimated a garrison of 15,000 Japanese troops on Saipan. They were very, very wrong. The Marines and Sgt. Genaust would be assaulting an island with over 30,000 Japanese troops (although only about half were armed), fighting to the death to protect THEIR land. Photo reconnaissance was extensive. It was so extensive that the Marines had rubberized 3D maps of the island made to familiarize the young Marines as to the terrain.¹ Even trench lines were clearly visible. However, there was a shortcoming to these 3D maps: they could not show the spider holes, small pillboxes, caves nor the hardships in fighting in sugar cane fields. Remnants of the battle: a destroyed Japanese pillbox on Saipan, courtesy of my flickr friend reef_wreck. 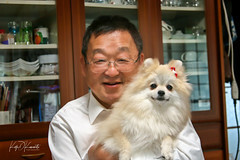 Clicking on the picture will take you to his photostream. On June 15th, 1944, Sgt. Genaust was one of about a dozen motion picture men assaulting the western beachheads in LVTs and Amtracs (see below). The 4th Marines assaulted the southern beach area and the 2nd Marines just to the north². About 8,000 Marines hit the beach in about 20 minutes. A sunken LVT at Saipan. Linked from the Pacific Maritime Heritage Trail website. However and as seen above, many did not even make it to the beach. As the hundreds of landing craft reached the edge of the reef, they were at the receiving end of pre-sighted Japanese artillery. Some landing craft overturned, drowning the young Marines. Others took direct hits from artillery fire, completing obliterating the landing craft and the Marines on board. As they got closer to the beach, the landing craft received small arms fire. Remnants of death. The sole of a Japanese soldier’s combat boot on Saipan, unearthed at the site of the largest banzai charge of the war. Courtesy of my flickr friend, Reef_Wreck. Clicking on the photo will take you to his photostream. To further worsen the situation, stiff currents carried part of the 2nd Marines further north than planned. Once on the beach, they found themselves 400 yards too far north. They would now have to fight back towards their comrades in the 4th Division. A US Marine tank lays half sunk on the reef off the invasion beach on Saipan. Mt. Tapotchau, the highest point on the island and from where Japanese spotters directed artillery, can be seen right behind the open hatch. Photo courtesy of my flickr friend, reef_wreck; clicking on the picture will take you to his photostream. 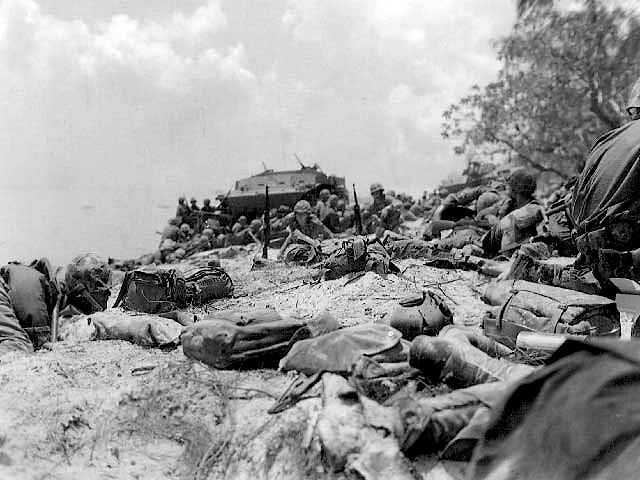 Once on the beach, the Marines received targeted artillery and mortar rounds, directed by Japanese spotters above Mount Tapotchau, the highest point on the island. The Japanese were equipped with 16 – 105mm, 30 – 75mm, and eight – 150mm guns on the high ground. Remnants of the battle on Saipan: a still unexploded round laying in the sand, courtesy of my flickr friend, reef_wreck. Clicking on the picture will take you to his photostream. The battle became a slugfest, which included the largest tank battle in the Pacific War (the Japanese sent 44 tanks to attack the Marines and the soldiers who had landed the second day) and towards the end of the near month-long battle, the largest banzai charge of the war. In the banzai charge, over 3,000 Japanese soldiers – some armed with spears – charged the Marines and soldiers, with brutal hand to hand combat lasting for over 15 hours. It was total carnage. Both attacks occurred under the cover of darkness. Fear at its peak. A destroyed Japanese tank near the southern airstrip on Saipan taken by the US Marines (It is now Saipan Airport). Photo courtesy of my flickr friend reef_wreck; clicking on the picture will take you to his photostream. In his first taste of combat, it is reported Sgt. Genaust did extremely well as a cameraman. Although surely trembling with fear along with his comrades, his first film reel was remarkably of steady hand. (I’m so old now, I can’t even hold my own camera still anymore. Incredible courage that man had.) Remember, this is before image stabilization. Much of the more viewed footage that can be seen now on the internet was shot by Sgt. Genaust. In it, you can see the intense emotions in the young Marines. Their faces. Their body language. Not only are they trying to fight the enemy, the fear is evident as death lurked everywhere. The assault on Saipan begins. There will be about 2,000 casualties in the first day alone. USMC photo. Sgt. Genaust was filming for about three weeks. Sadly, only three of his reels survive today. The others have been lost. And while specifics of his combat actions are lost with time, there was an interruption in his filming. However, it is clear he was fighting for his life as a rifleman. Nowhere was safe on that island. Unexploded American hand grenades still litter the Saipan landscape. The military still collects the potentially unstable and unexploded ordnance then blows them up even today. Photo courtesy of my flickr friend reef_wreck; clicking on the picture will take you to his photostream. And although he primarily shot with his movie camera, he also shot with his carbine. On Sunday, July 9th, 1944, Sgt. Genaust and his buddy Howard McClue, found themselves near the Marpi Airstrip. They were under orders to eliminate all resistance on the northern part of the island. They were to hook up with other Marines approaching from the opposite direction. Their first contact with the other Marines was with a tank. Their tank commander asked for riflemen so Sgt. Genaust and two of his buddies, including fellow cameraman Howard McClue, began to follow the tank. The tank then hit a land mine and was destroyed. As they continued on with their mission, they were ambushed by the Japanese of platoon strength. Apparently outnumbered, Sgt. Genaust apparently ordered the two Marines during the firefight to go back and get reinforcements. Genaust was then alone to fight them off. He was in a fight for his life, with his carbine the only thing protecting him from a potentially ugly death. 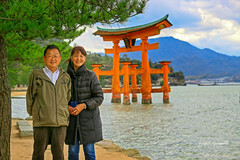 The Japanese had erected structures with corrugated tin roofs like those you can see in the background. Naval and artillery barrages obliterated such structures but in doing so, would scatter the corrugated tin. Japanese soldiers would lay under such sheets laying in wait as Marines would approach to clear the village. USMC photo. McClue was successful in bringing back reinforcements. He was apparently not 100% clear on where he left Genaust but did locate him roughly 50 yards away. Just then, Genaust rose up to direct the Marines towards the enemy but was then immediately shot through his thigh. In the time McClue was gone, Genaust single-handedly killed nine Japanese soldiers. Incredible when you think he was a cameraman…but he was a Marine first and foremost. He was expert with his rifle. For his courageous action in combat, a Colonel Dickson had written a handwritten recommendation for Genaust to be awarded the Navy Cross, the second highest medal for bravery. Only the Medal of Honor is higher. Unbelievably, his recommendation for the Navy Cross was declined. Instead, he was only awarded a Bronze Star. The reason was beyond belief: the Navy declared he was not an infantryman but only a cameraman. The Marine Corps is never wrong, of course, but they were sure short on being right. While Genaust could have elected to stay back in the States, he declined. He was headed for Iwo Jima. Please stay tuned for Part 3. 1. This was the first time 3D maps were used. 2. The assault force also included the US Army’s 27th Infantry Division under the command of US Army General Ralph Smith, who was later sacked by Lt. General Howlin’ Mad Smith of the USMC. 3. Old Man Jack told me wounds would get infected very quickly in the jungle heat and humidity, requiring immediate treatment. The Saipan invasion force was for once supplied with ample medical teams. 4. Ironically, July 9, 1945 was when the highest number of Japanese civilians lept off the cliffs at Marpi Point. They had been brainwashed by the Japanese military that they will be brutalized by the Marines if they surrendered. Mothers would throw their babies onto the jagged rocks below then follow them, or, they would jump into the shark infested waters. Many Marines were traumatized for the rest of their lives after witnessing this horror. They were trained to fight the Japanese military, not watch thousands of civilians jump to their deaths. Yet, many Marines risked their lives going up to cave openings to coax civilians out to safety, not knowing if there were Japanese soldiers inside. The largest banzai charge also just occurred two days earlier, on July 7, 1944. Saipan was also where a Los Angeles Mexican-American, PFC Guy Gabaldon, helped capture about one thousand Japanese civilians and soldiers. He was able to speak enough Japanese having spent time with a Japanese-American family and attended military language school. He was initially awarded a Silver Star but it was upgraded to the the Navy Cross in 1960. Admittedly, there was controversy on his true actions. At the end, American forces sustained 3,426 killed and 13,099 wounded. Japanese losses were approximately 29,000 killed (in action and suicides) and 921 captured. It is estimated over 20,000 civilians were killed.